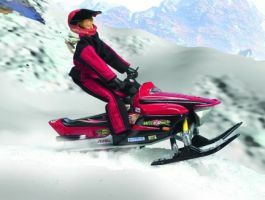 Race over the snowfields with Red Dogg and his super cool snowmobile. The Adventure Crew is always willing to go anywhere, anytime, and the ice caps are no exception! Pose him driving his snowmobile, climbing an icy hill, or any other way you like - Red Dogg has 17 moving joints. So grab your own coat and get ready for Adventure!